Epicure is a female owned company, specializing in healthy, delicious, nutritious foods for families small and large. They are Canadian owned and operated, and run on a direct sales model. Now, before you run to the hills yelling “noooo direct sales, run fast…” – hear me out. This is an amazing company, that really does care about their customers and consultants alike… that helps your food become Ah-Mazinnng! 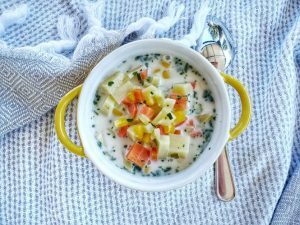 Have you tried Epicure’s Creamy chowder yet? With the increase of processed foods, and quick fast dinner solutions… we’ve also seen an increase in obesity and other food related health concerns. It turns out our lifestyles are starting to cost us. Not only do they offer delicious spices, seasonings, and salts, but meal kits and eating plans can make your life easier as well! Don’t have time to cook? Their microwave solutions are a hit too! How do I find and Epicure Consultant? Sure is! Searching for Gluten Free spices and meal solutions can be a royal pain in the cushion… but with Epicure life in the kitchen gets a whole lot easier! Epicure’s products are ALL GLUTEN FREE! They are working hard to become completely certified non- GMO, currently they are at about 85%. They are also 100% NUT FREE. That’s right. Does your little Johnny have an issue with nuts? Epicure has you covered! As a sugar and sodium conscious company, you will find far lower levels of both in your spice blends, and never ever any artificial colors, flavors or sweeteners. They refuse to use Corn syrup, High Fructose Corn syrup, Monosodium Glutamate (MSG), or Sodium Nitrates. But wait, there’s more. Actually loads more. 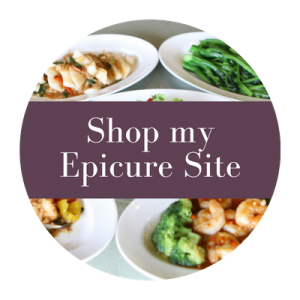 How do I purchase Epicure Products? You’ve read all the goodness, now you want to know how you can make it happen! If you don’t have a consultant of your own, purchase from my website or through your friend’s party link, and have delicious meal solutions dropped off right by your front door! Epicure is going amazing places, and you are welcome to come along too! My growing team loves to welcome enthusiastic entrepreneurs. I’ve always loved that with Epicure I’m in business for myself, not by myself. I make my own commissions, but have an amazing team at home office willing to help whenever needed. The freedom and flexibility were a must. As a stay at home Mom I was on the hunt for something that I could work on while the littles napped, but could also grow and pause as life’s waves rolled. Who is Epicure NOT for? At this point Epicure is only open to Canadians. Sorry USA… hang in there… we’re coming! The hope is that by early 2019 we will be set up to party in the USA. To the rest of the world: we love you… but unfortunately we aren’t able to ship your way at this time. Those who like boring food. If you are happy with the same sad food everyday, I don’t think I’ll be much help to you. Epicure brings delicious, fresh flavor to plates across Canada, promising healthy meals real fast. Are you interested in some delicious recipes using Epicure products? Pop on over HERE for more!